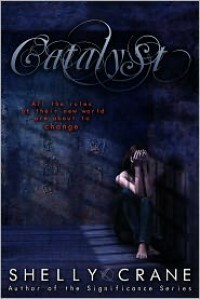 Catalyst by Shelly Crane Book Review! Hi! I'm back and I'm finally reviewing Catalyst, which is the third book in the Collide series by Shelly Crane. Taking place immediately after Uprising, Sherry being tortured by the Lighters. but is saved by her friends. Cain has completely fallen for Lillian, and Lily's powers are getting stronger. One my favorite things in this series is the relationship between Sherry and Merrick, and their daughter Lily. It just so adorable and I love it! Sherry and Merrick are one of OTPs. I love them so much! Another couple that's adorable is Jeff and Marissa. They are so cute, especially in this book. I TOTALLY KNOW SHE WAS PREGNANT! I WAS RIGHT! I love that the four year-old knew she was pregnant and just dropped the ball in front of everyone! Cain and Lillian are one of my favorite couples of the series. They are amazing, and just so lovable. At this point they obviously are in love with each other. Danial is okay. He a really good guy. I just tend to get a little territorial about my OTPs so everytime he talked about how much he loves Lillian I kind of was like "NO! NO! HECK NO!" But really, Danial is a good guy. And holy cow! That ending! What a cliffhanger! What the heck!!! But seriously, this book is awesome, and I highly recommend it.